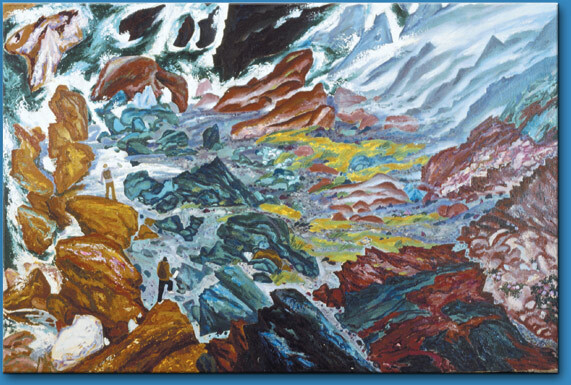 The paintings of series: "Oval of Sakhalin"
There is a huge garden of stones in fantastic shapes right in front of us. It is as vast as our life and as round as a circle. You jump from stone to stone and realize that your way is endless and only the stone steps change their color. They are sometimes green or grey, sometimes black as a charcoal and white as snow. Seawaves struck them hard and become a fluffy foam, and fog appears among the stones. This is a garden of our life with steps that each of us chooses himself. It's full of different feelings - they are happy and sad, wise and foolish and we will collect all them through ages into our own multicolored staircase. Paintings The paintings of series "Eastern Album", "Kamchatka"
Photoblogs (in Russian, please use online translator) Items with tags "Rocks and stones", "Awareness"... all category "Sakhalin", "Kamchatka"
Albums "Sergey Emets. The paintings. ", "Eternal Sakhalin", "Kamchatka"
Films "Oval of Sakhalin", "Such a sweet name - Kamchatka"